I am a bit surprised to see Google Images provide a way to go back to the old Google Image Search design. In July, Google came out with a new Google Image design, infinite scroll. As you can imagine, not everyone were fans of the new design. Webmasters didn't like it cause it slowed people from visiting their site with the actual image. Searchers didn't all like it cause it was not what they were accustomed to. There were many bugs with it over the past months as well. 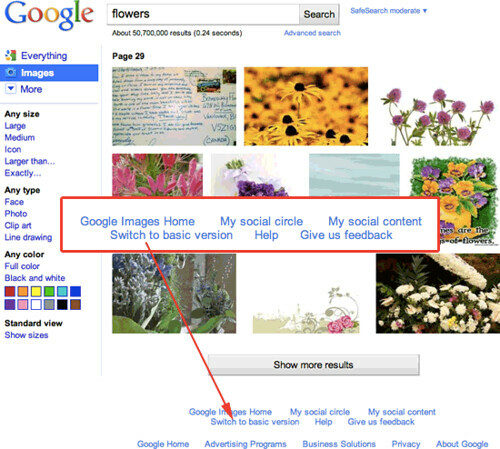 Today, I believe for the first time, there is a way to go back to the old Google Image search design. If you scroll to the bottom of the images on the page, there is a new button that reads, "Switch to basic version." Clicking on it will take you to the old classic design. You can of course then switch back to the "Switch to standard version." Google has slowly been giving searchers a way out of their bold new interfaces. When it came to Google News, they slowly are bringing back the old design. The Google fade in went away with Google Instant and so did their redesign. But when will Google Instant be reverted? Update: This is old news and has been there since day one. Sorry for the false alarm.